3 - 3............Bingo vom Dornberg. 4.4 - 5.........Lump von Hagenstolz. 4 - 5............Carmen vom Felsingpass. Winner at Amsterdam in 1972 and 1973. “This black male was imported into Holland from Germany by Mr Stokman. Jürgen was only 68 cm tall but was short and well built with plenty of substance. He had tremendous depth of the brisket. The only criticism that people made of him was that he had a soft temperament. Nevertheless he passed his Schutzhund 1. He became a German, Dutch, Luxemburg and International Champion. He was the Winner at Amsterdam in 1972 and 1973. He also gained the DV-Sieger title. 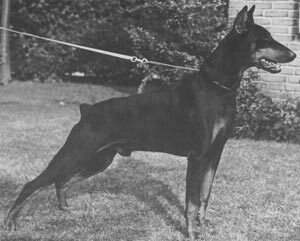 Lowell: SchH 1 and sire of the vom Eschenhof “M” litter (Mira).